You Want Cries With That? Posted in Misc and tagged Crying Chair, McDonalds at 8:41 pm on June 19, 2018 by Bodger. I have many feelings on this and they are all at war so I think it’s best I have a glass of wine and come back later. This is a good thing, no? – there is a housing crisis, but an employer is doing their best to get its employees sorted. One of my many warring feelings on this. 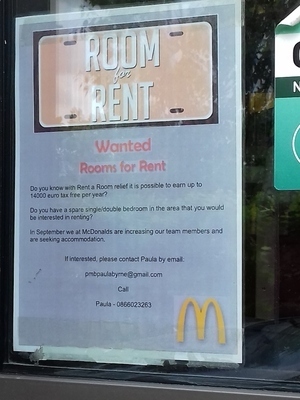 On the one hand, yes, it’s commendable that McDonald’s are helping their staff to find accomodation. An argument could perhaps be made that improving staff wages would also be helpful – but undoubtedly unfeasible, regardless of how big a company McDonald’s is. A lot of them are franchises, aren’t they? I’m not sure how much of a factor that would be, tbh. On the other hand it’s a rather damning illustration of what life in Ireland is like, and precisely how the housing crisis is affecting not just workers, but their employers – and is worrying when you consider that our economy/jobs market is set to expand in the coming years. McDonald’s and other large employers should put pressure on the government to get the finger out re housing supply. Because god knows they don’t give a flip what people want, but they’ll listen to big business. true – but it is a good thing that big business is pressuring the government to build more. dunno. I suppose what the government should be doing is applying tax fairly against all businesses – and then there would be sufficient money to pay for services. But big business doesn’t want to pay it’s share of tax. It does seem to be the work of a conscientious branch manager rather then the company itself, so I do think it’s very commendable. I don’t think the individual franchisees have any real say over staff wages, though I am perfectly happy to be corrected on that. Digs and boarding-houses used to be one of the primary ways of housing young people who moved to cities – perhaps it’s time they saw a resurgence? I don’t see why an individual franchisee can’t set their wages at whatever level they wish (above minimum). They may be prevented from raising the prices of the food above a particular threshold – but if the franchisee want’s to reduce their profit and pay staff more – I can’t see HQ stopping them. 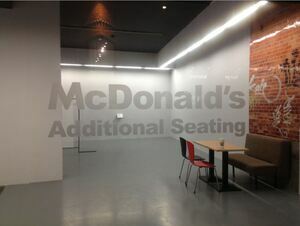 A little digging shows you are quite right – wages are one of the few matters McDonald’s leave to the franchisee’s discretion. The rent-a-room scheme offers a decent tax free sum to house owners but there appears to be little mention made of it. Anyone know the number of house owners availing of it or where they’re located? Your not renting a room though. Your sharing your home with someone else. Something a lot of homeowners find unpalatable. For those who want to make a few quid now and then thereis AirBnb, a lot less commitment and often profitable. Speaking of airbnb , it remains completely unregulated by our free market loving leaders. How many apartments are being rented on it that could otherwise house long term Dublin residents? Just one simple thing this gov could and won’t do is reign in Airbnb at least for whole prop lettings. The rest of their inertia on planning rules land hoarding and delaying vacant site tax till 2019 is simply baffling given the problems we face. Irish people at home with their mammies at 35.. immigrants piling into the country to serve the economy ( also needing accommodation) and NOTHING is being done on housing. I live 4 stops from town on the dart .. the road leading up to the station is filled with vacant old industrial sites, yes 10 mins from Tara st.. why are these places not zoned residential? You could fit multiple blocks of 5 story apts? McDonalds hardly acting out of the goodness of their hearts. It’s a stark illustration of how the housing crisis is now bleeding out into the wider economy. There are jobs, and people willing to take those jobs, but finding a place to live is becoming an obstacle. It’s pretty depressing, but I guess we all know that. And hopefully Eoghan Murphy will come out with another report. They have been working a treat so far. No, it probably is; I was in a Maccy D’s at the weekend and there was a brass plaque on the wall beside the tills with a few email addresses for complaints, inquiries, etc. and they were all gmail addresses. Dunno why McD’s isn’t supplying @Macdonalds email addresses for the staff but maybe it’s something to do with it being a franchise? I assume it is to do with the franchise. 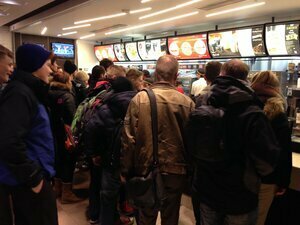 The franchisee is responsible for everything (albeit under strict rules laid down by McDs). I hope amazon don’t see this!!!! Ireland. Where tourists stay in apartments and families live in hotels.